The big guy’s day is fast approaching. Being married to a chef often comes in handy on these types of holidays. When I think of my big, burly Soldier, meat and potatoes comes to mind. 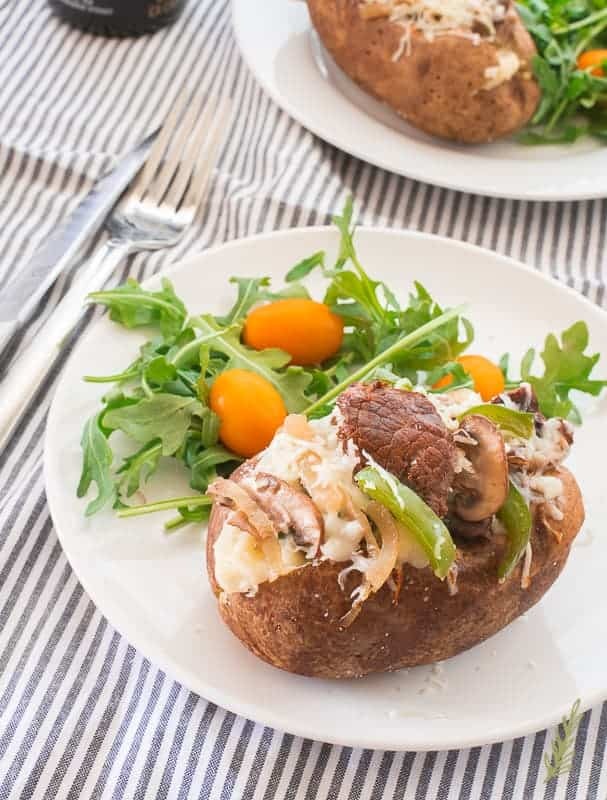 These Philly Cheesesteak Baked Potatoes up the ante with a unique spin on that manly staple. I’m combining the seasoned steak-mushroom-pepper and onions classic with a French aligot mashed potato-cheese sauce. Stuffing the whole combo back into the potato jacket makes it a delicious pocket of testosterone. YUM! Philly cheesesteaks- at least the ones I grew up making myself- are typically made with an unknown paper-thin sheet of “meat product”. A few of you may know what I’m talking about. 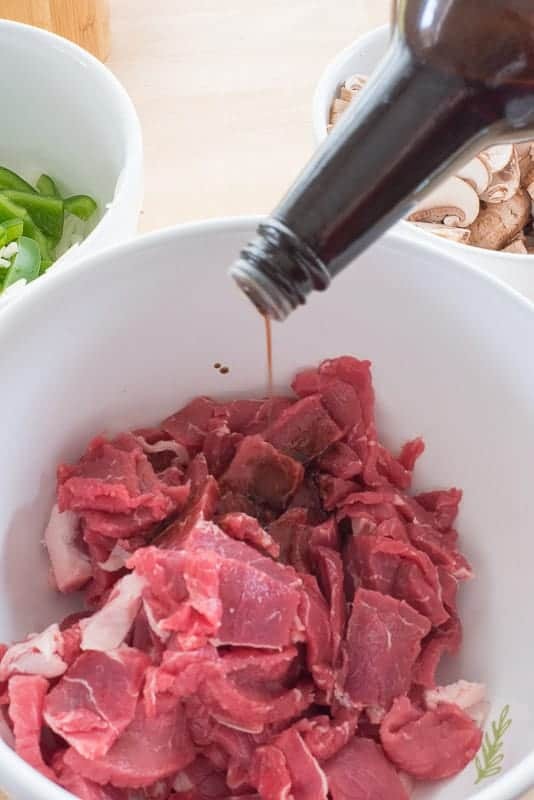 Any frozen meat that ends with “Ummm” was sufficient for making Philly cheesesteaks at home. 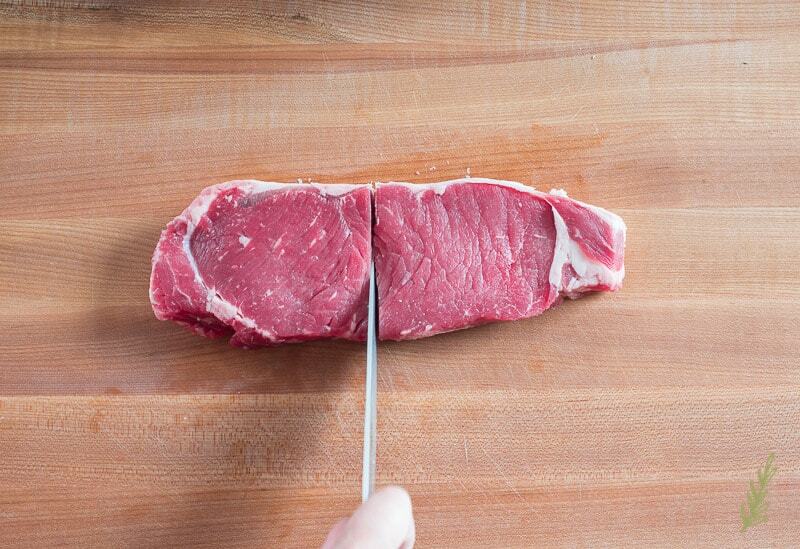 With age comes sophistication, though; so, for my adult version, I use a New York strip cut. Not the typically cut, but nothing to balk at. Freeze cuts of meat that you intend to slice thinly for at least twenty minutes prior. 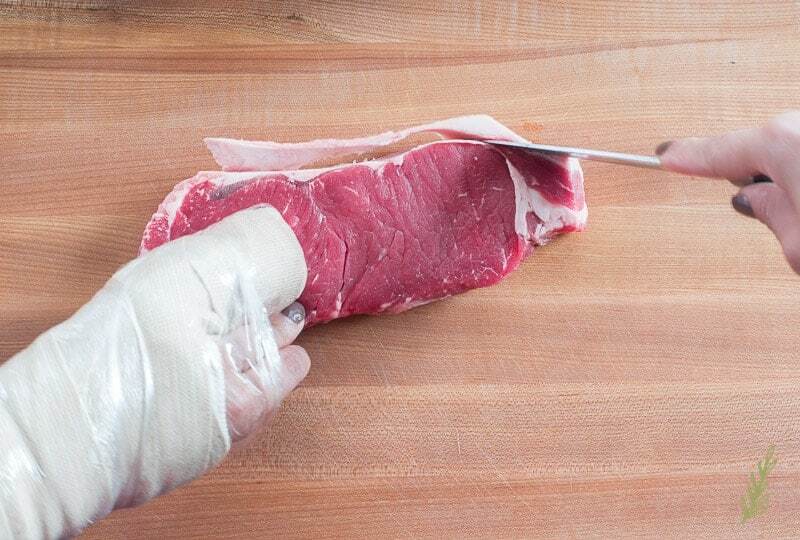 This shot of cold air will firm up the meat enough that slicing won’t be a hassle. In the meantime, grab a sheet pan and your clean, dry russet potatoes. When you’re looking for good baking potatoes, choose those that are a quarter- to a half-pound. Obviously, the bigger the eater- the bigger the potato. A common size potato is preferred because you want them all to bake evenly and at the same time. Drizzle a bit of mild-tasting cooking oil over each potato and use your hands to rub the oil into the skin of the potato thoroughly. This coating of oil will help the potato jackets become nice and crisp during baking. After massaging in that oil, use a dinner fork or the tip of a sharp knife to make small holes all over the surface of the potatoes. This step helps the potato vent all of the steam it’ll build up while cooking. The final step for our potatoes is to liberally season them with salt and pepper. Now, I don’t know about you, but there were times growing up where we had to drink powdered milk. As a result, I’ve become very conservative in what I will, and won’t, allow my family to throw away. If you begin with a clean potato, there’s no logical reason to throw away the outer skin. Hence, I season them because we gon’ eat ’em. Pop your pan o’potatoes into the oven and bake for an hour. 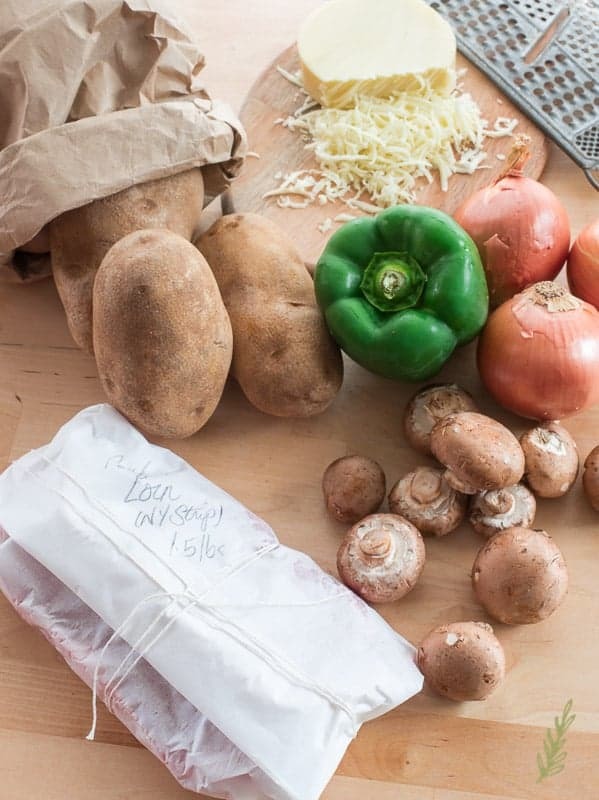 While your potatoes are baking, prepare your Philly cheesesteak filling- starting with the prep of the veggies. 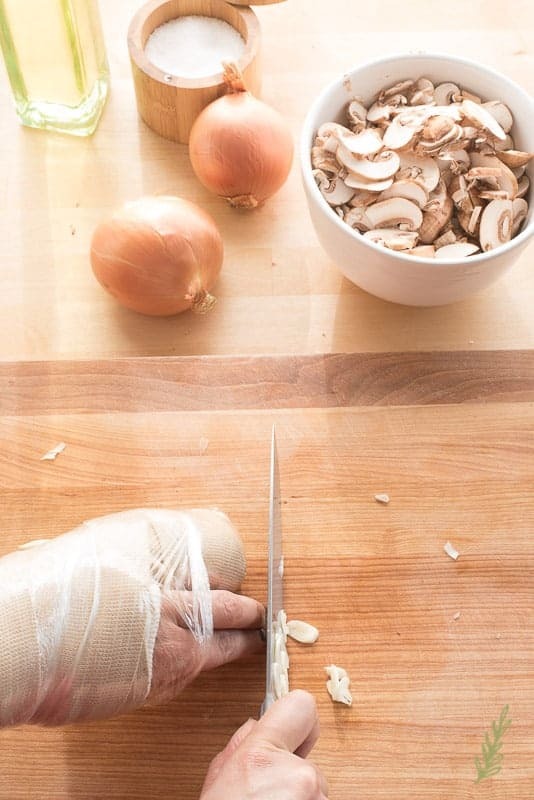 Grab a cutting board and a chef’s knife. You’ll notice this recipe was shot during my days of gimpdom. I’m happy to report that I am on the mend, cast-less, and left with a disfigured pinky which will be making an appearance in future posts, I’m sure. 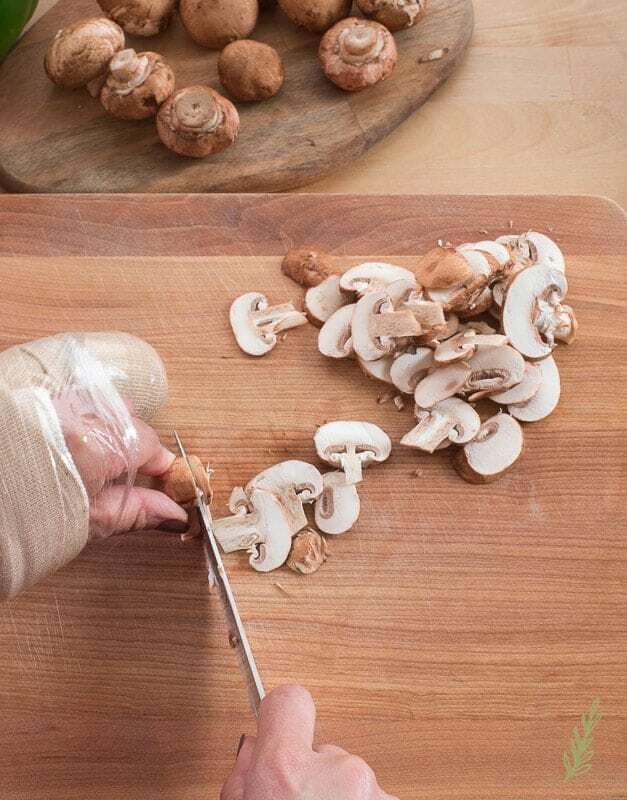 I start out by slicing off the tip of my mushrooms’ stems. From there, thinly slice the whole mushroom. Set them aside. The next veg to be prepped are our green bell peppers. 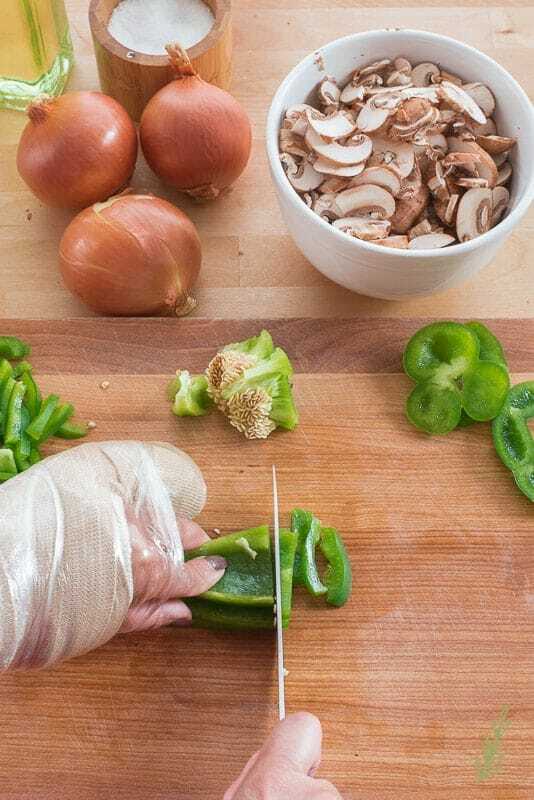 Bell peppers, onions and mushrooms are the classic combo for most Philly cheesesteaks, so I’m staying as true as possible. I core the bell pepper, then slice it in half. From there, I cut the halves into thirds and thinly slice them (widthwise). For a typical Philly cheesesteak sandwich, I would just slice my bell peppers and onions in rings. I’m going this smaller-sliced route because I want to make the potatoes and their filling as compact and bite-sized as possible. Place these in a separate, larger bowl. Next thing to slice are the onions. For these, I lop off the end opposite the root. I need that root to stay in place to hold the layers of the onion together as I slice. Place the onion onto the flat area created from that cut, and cut the onion in half (through the root). From there, it’s easier to peel the skin off of the onion. Cut the onion in half, but don’t cut through the root. Stop short of cutting it completely in half to keep the onion from separating too much on you. Now slice the onion in thin slices across its width. Place the slices in the bowl with the green peppers. 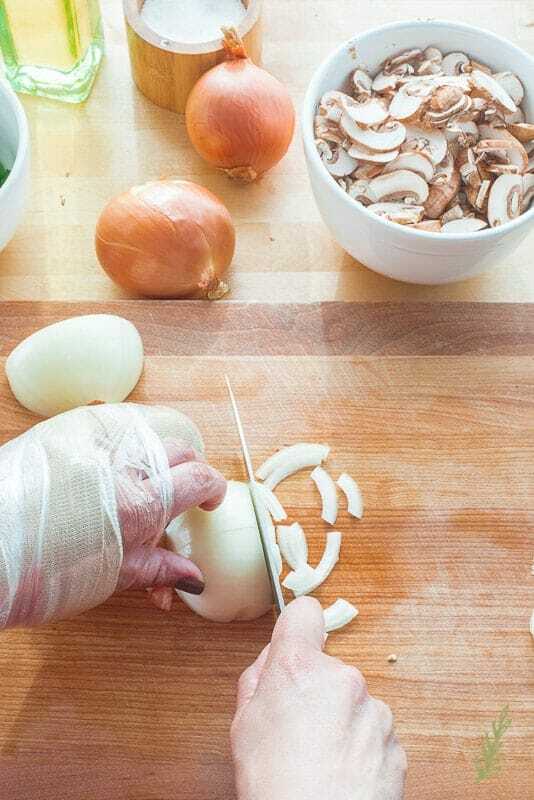 Thinly slice your peeled garlic cloves and add them to the onion/pepper bowl. Now comes the point when I veer from tradition. The invention of the Philly cheesesteak is credited to Olivieri brothers from Philadelphia, PA. They used ribeye for their cheesesteak. I ain’t ballin’ like that so I use NY strip. Not as tender as a ribeye, but nothing to shake a stick at. Besides the cheese I use, this is one of the only differences in my cheesesteaks from the original. Now, you can use ribeye if you have the budget for it. Whatever you do, don’t use that trash meat they sell in boxes with the parchment paper between the “steaks”. I shudder at the thought. By now, if you put it in the freezer earlier, as I suggested, the meat should be perfectly firm for thinly slicing. But first, remove any excess fat from the steak. A thin layer of fat is fine, anything over a quarter of an inch should be trimmed off. Like with the veggies, we want these pieces of meat to be bite-sized. I start by cutting the steak in half and then in quarters. Check out which way the grain goes and thinly slice, at an angle, against that grain. 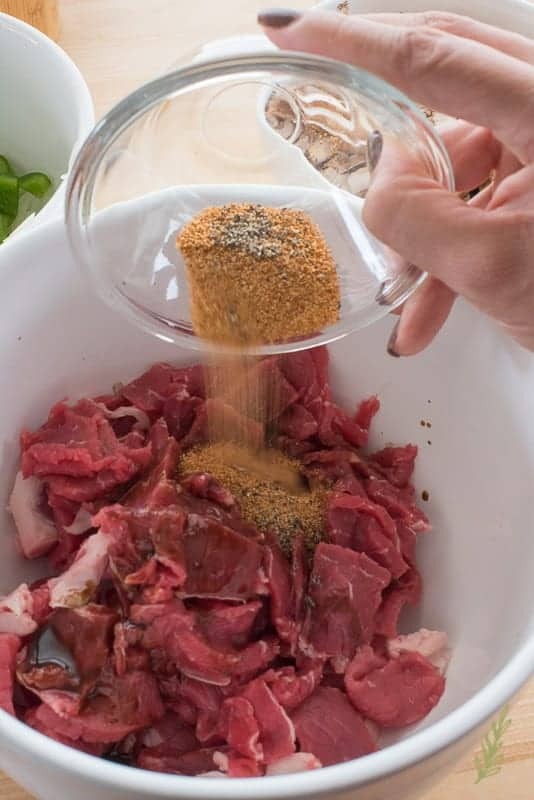 Toss your steak slices into a separate bowl. To season the steak, I add worcestershire (I totally had to use autocorrect for that- I can’t even spell it right, let alone say it). 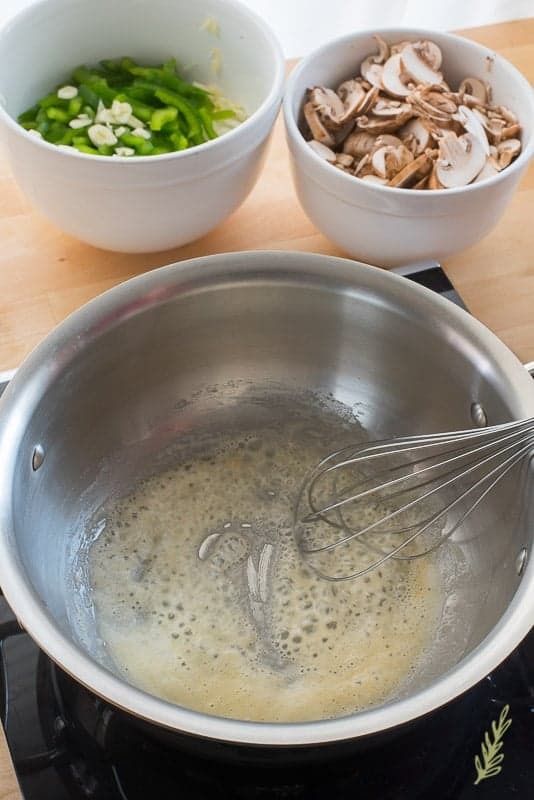 In a large saute pan, heat a tablespoon of vegetable oil over medium-high heat. Add the steak slices and sear until browned. Remove them from the pan with a slotted spoon. You can place them in a clean bowl off to the side. Using the same pan (no need to clean it out) add the mushrooms and sauté for ten minutes, or until the water extracted from them has almost completely evaporated. They should begin to take on a golden brown hue. Add the peppers, onions and garlic to the pan and sauté until the mixture is a nice, golden brown color. Mix the veggies in with the cooked beef and set the container holding them in a heated oven to keep warm. Now you can begin the cheese sauce base for your aligot, or mashed potato cheese mix. 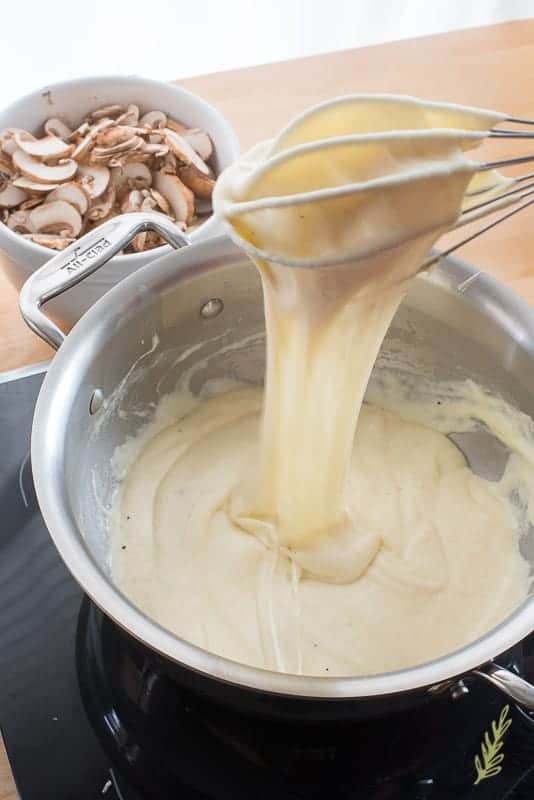 Make your cheese sauce in a saucier, or a sauce pan with sloped sides, which will prevent any of your thickening agent, a roux- in this case, from getting stuck in the corners and scorching. Add the butter to the pot and allow it to melt. Whisk in the flour and allow it to cook for at least one minute. Pour in cream and season the mixture with salt, pepper, nutmeg and dijon mustard. Whisk to combine completely. Bring the mixture up to a simmer. Allow the béchamel sauce (milk sauce) to thicken while whisking frequently. 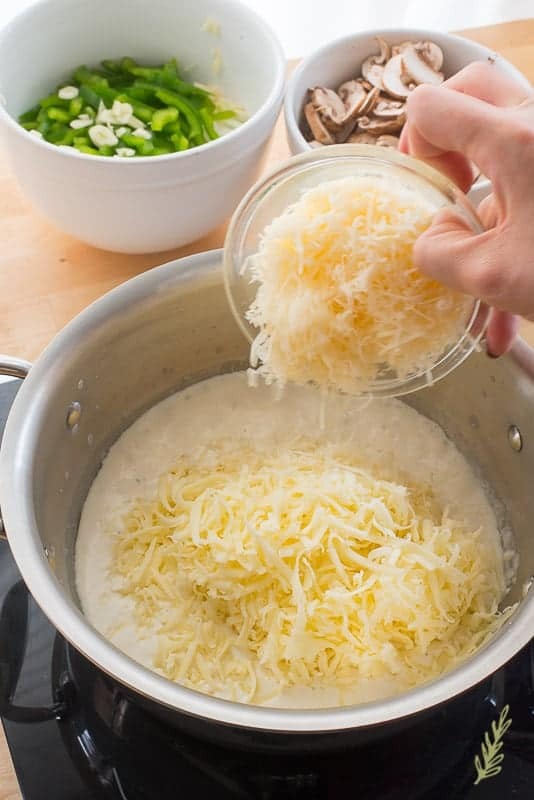 Once the bubbles in the sauce begin to look like thick lava, add your shredded provolone and white cheddar cheeses. Use block cheese that you shred yourself. Any pre-shreded cheese will contain an anti-caking agent that will prevent your cheese sauce from being completely smooth. Whisk the cheese into the béchamel sauce making sure it’s fully melted. By this stage of the game, your potatoes should be perfectly baked. A sharp knife inserted into the middle of the largest potato should feel no resistance. If your knife feels like it’s not going in effortlessly, bake it for fifteen minutes longer. Once your potatoes are completely baked and slightly cooled, make a slit down the middle of the potato- lengthwise. Use your fingers to push the ends towards the middle to open the potatoes slightly, scoop out the meat of the potatoes and place them into a separate bowl. You can also just cut the potatoes in half and scoop out the inside. Mash the potatoes until they are smooth using a potato masher or ricer. Add them to the cheese sauce to combine. You should have a loose cheese/potato mixture that should run like a really thick pudding. As the potatoes cool, they will begin to thicken. That’s not a bad thing, but the faster you fill your potatoes, the easier (and less messier) it should be. Fill your empty potato skins with a half cup of the potato mixture. Top your filled potatoes with the beef and veggie mixture. Overflow is acceptable in this case, so divide the cheesesteak topping among your potatoes equally. 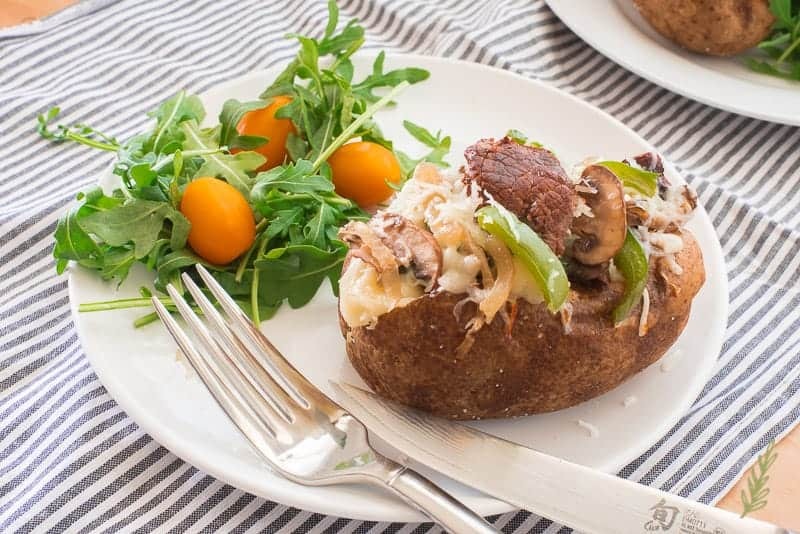 Finish the Philly cheesesteak potato with a generous topping of shredded cheese. Broil on low until the cheese is melted and bubbly. Remove the potatoes from the oven and serve immediately. The only thing I serve with these stuffed pockets of love is a fresh garden salad. They are a great addition to any holiday, but especially one that celebrates the Dad in your life. Pin this recipe for later and share with your favorite Dad. Philly cheesesteaks and french fries get married in this amazingly hearty dish. 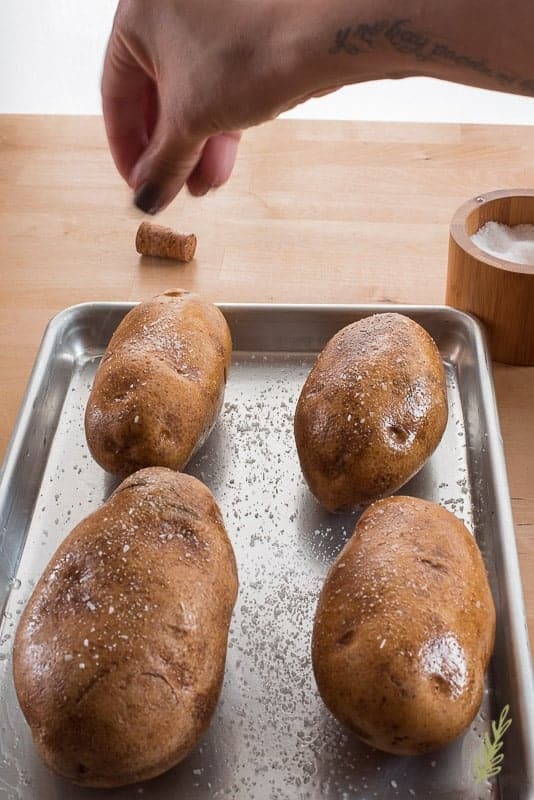 Wash and dry your potatoes and place them on a sheet pan. 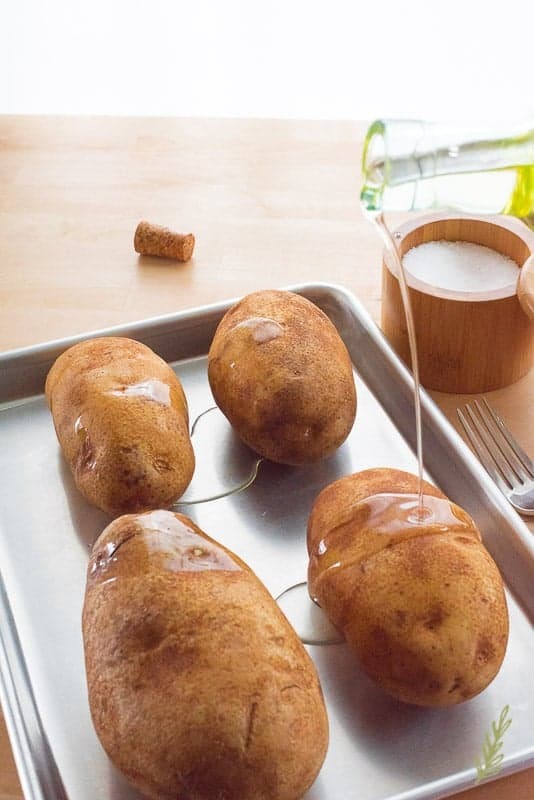 Drizzle a tbsp of oil onto the center of the pan, then use your hands to rub the oil into the skin of each potato. 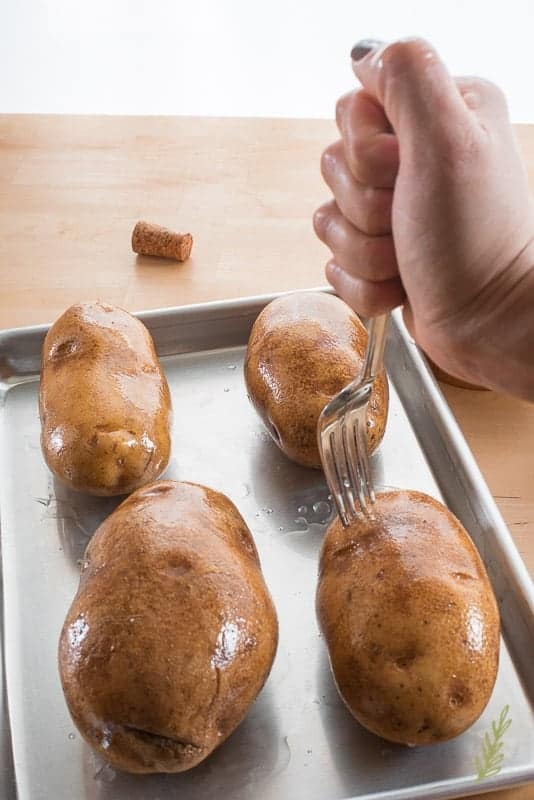 Use a fork, or the tip of a knife, to make small holes all over the surface of the potatoes. Sprinkle them with a tsp of salt and a 1/2 tsp of pepper. Place the pan of potatoes into the oven and bake for an hour. Season the steak with the worcestershire and season salt. Toss to coat completely. In a large saute pan, heat the remaining oil over medium-high heat. Add the steak slices and sear until browned. 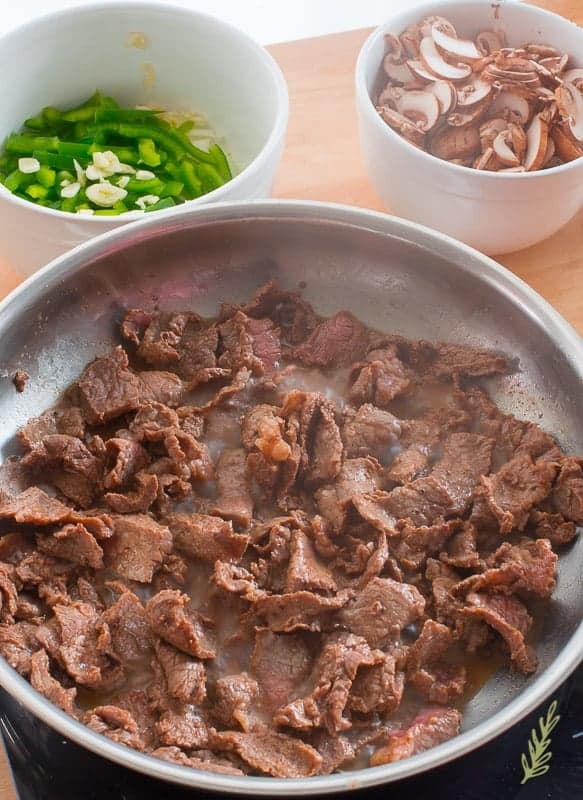 Using a slotted spoon, remove the meat from the pan to a clean dish. 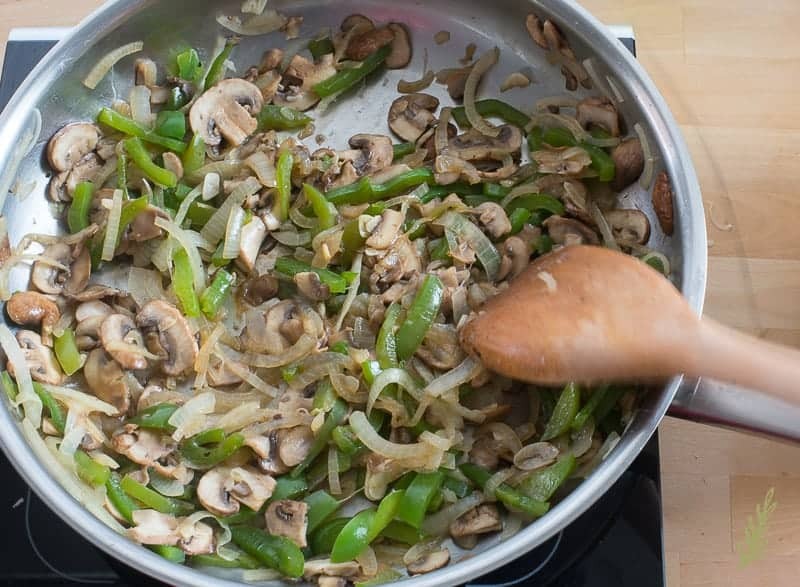 Using the same pan, sauté the mushrooms for 10 minutes, or until the water extracted from them has almost completely evaporated. Add the peppers, onions, and garlic to the pan and sauté until the mixture is a nice, golden brown color- about 6 minutes. Mix the veggies in with the cooked beef and set the container holding them in a heated oven to keep warm. In a saucier, or a sauce pan with sloped sides, melt the butter over medium heat. Whisk in the flour and allow it to cook for at least one minute. Pour in the warmed cream and season the mixture with the remaining salt and pepper, the nutmeg, and the dijon mustard. Whisk to combine completely. Bring the mixture up to a simmer. Simmer until thickened whisking frequently. 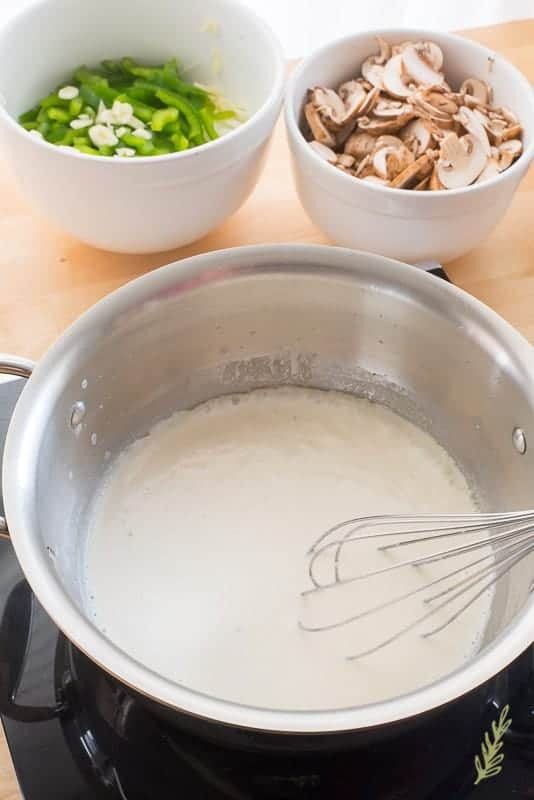 Add your shredded cheeses and whisk them into the béchamel sauce making sure it's fully melted. 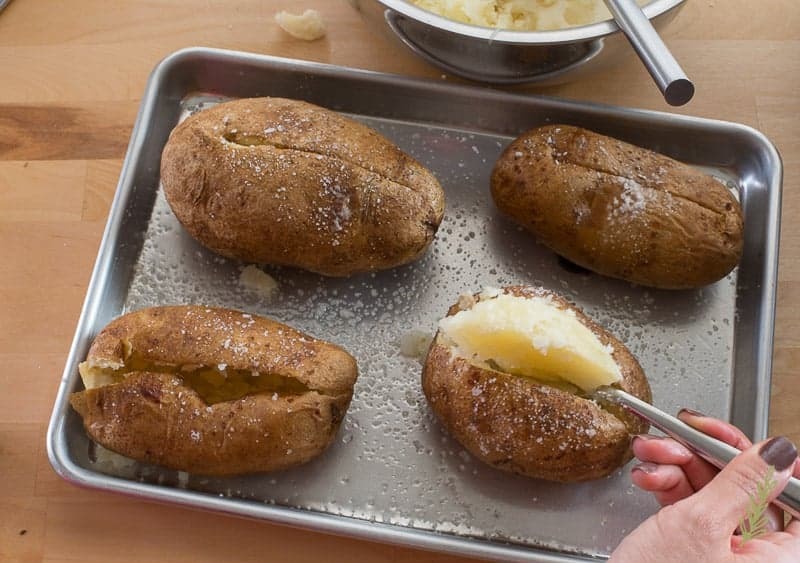 Remove the baked potatoes from the oven and make a slit down the middle of the potato- lengthwise- using a sharp knife. 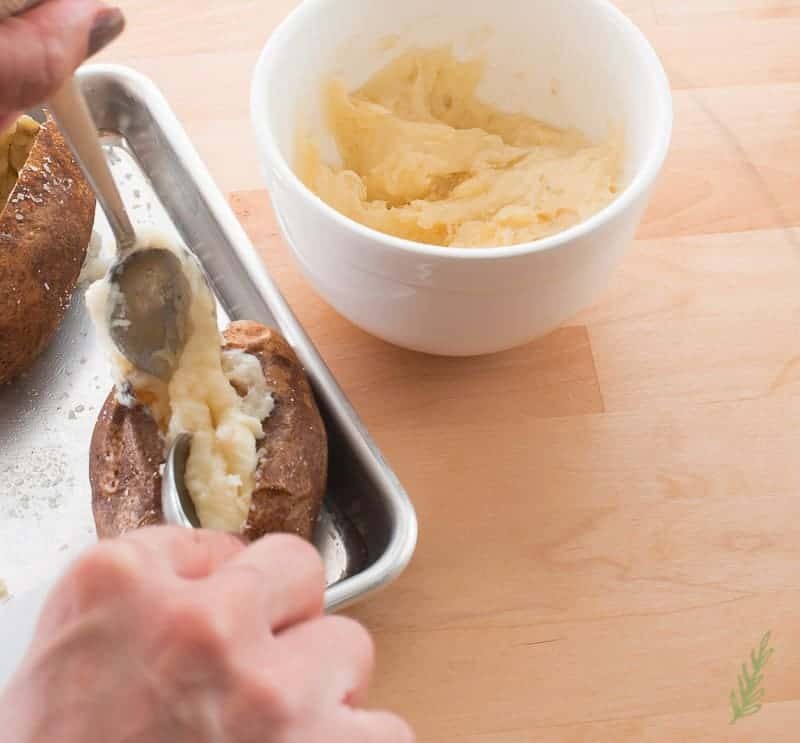 Use your fingers to push the ends towards the middle to open the potatoes slightly, and carefully (they're hot potatoes), scoop out the meat of the potatoes and place them into a separate bowl. 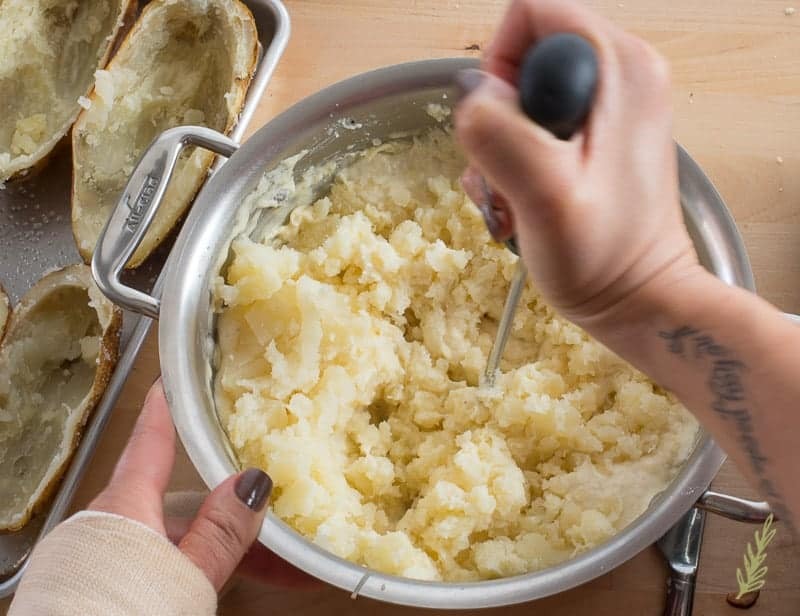 Mash the potatoes until they are smooth using a potato masher or ricer. Add them to the warmed cheese sauce. 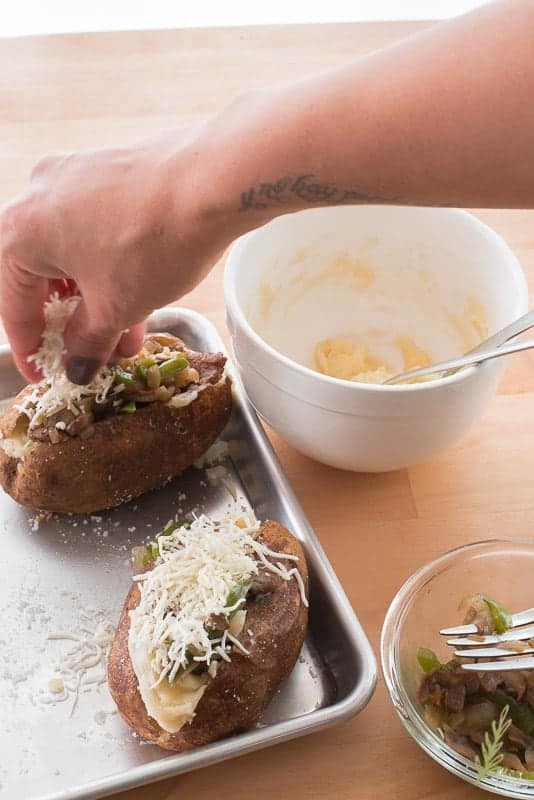 Fill your empty potato skins with a half cup of the potato mixture. Top your filled potatoes with a cup of the beef and veggie mixture- it's okay if the potato overflows, it's a full meal, remember? 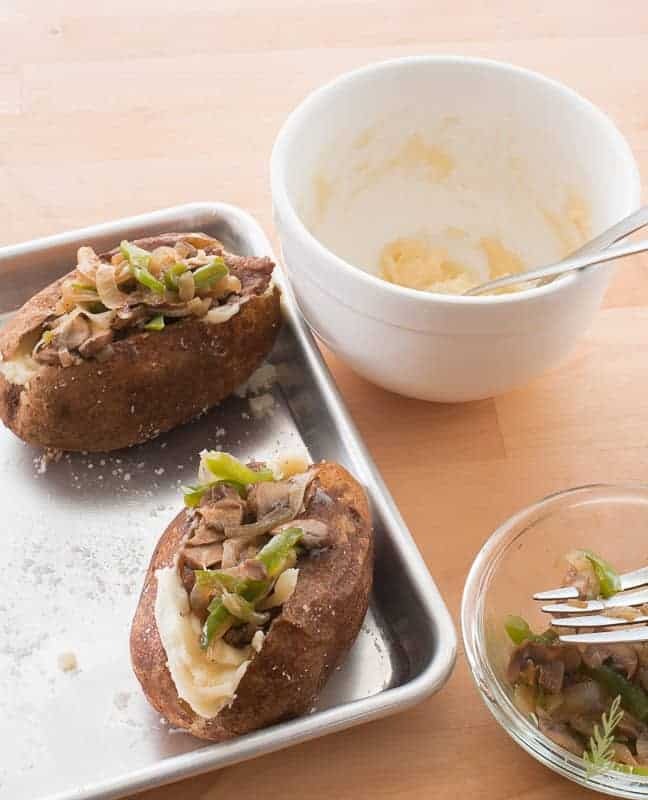 Finish the Philly cheesesteak potato with a generous topping of shredded cheese. Broil on low until the cheese is melted and bubbly. Remove from the oven and serve immediately. This is such a great idea to twist on a classic. 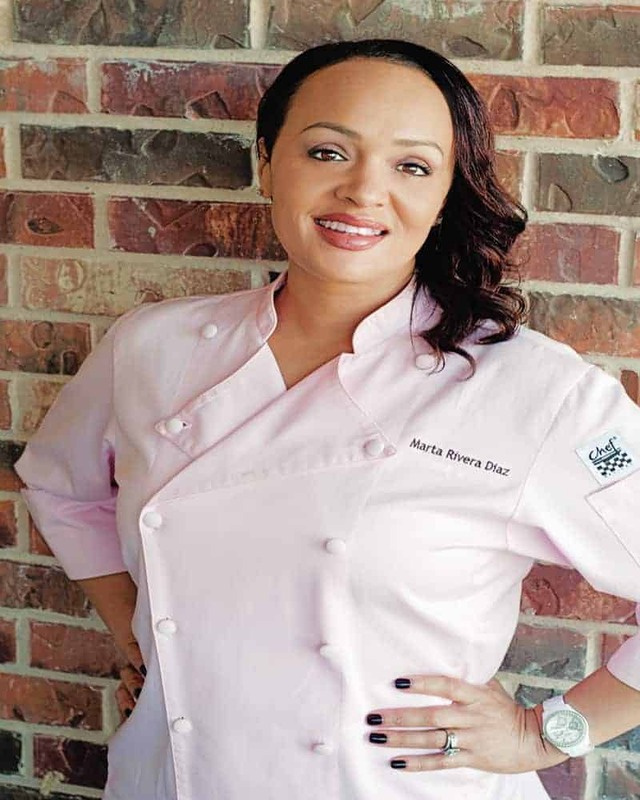 Im always look for new ideas and helpful tips to make meat! I hope your hand is okay! It is! My little finger is all deformed now, but the cast is FINALLY off. Thank you so much for asking, Harmony! I am so hungry look at those beautiful and yummy photos! 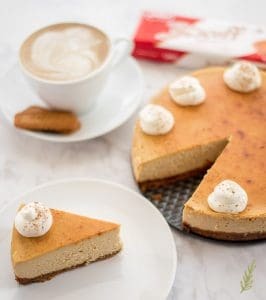 This recipe looks beyond delish! Thanks for sharing! Thanks so much, Karen! Sorry I made you hungry, but I do hope you get a chance to try out the recipe! Oh my goodness this looks and sounds amazing. I forgot about seasoning the outer skin of the potato. Great reminder. Thank you for sharing. Yes! It’s such a game changer, Annette. I take a fork and knife to that bad boy and by the time dinner is over there’s no trace of the potato (I take eating seriously). I love Phillip cheesestesk. Topping baked potatoes with it will be a double treat. I agree! 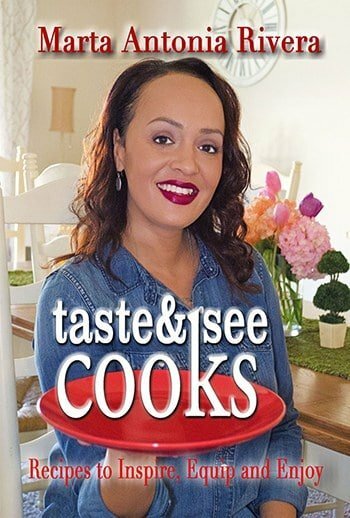 It’s like having the cheesesteak and fries in one bite, Tami! OMG this sounds amazing! Adding this to my must-make list! Thanks, Rachel! I hope you love it like we do! I have to make this for my fiance! This looks SO delish! Oh, yes, Chelsea! I hope he enjoys it! 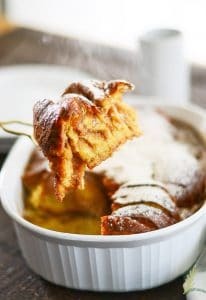 You can’t go wrong with this recipe, you have gone into so much detail. I tried, Harriet! I don’t want anyone to feel lost during the process. These look absolutely amazing! They seem pretty easy to make too. Really easy, Marissa! A few steps, but we’re worth it, aren’t we? Ooh! 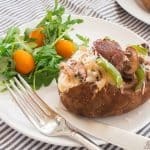 I love adding fun toppings to my baked potatoes! What an interesting idea! Marcie, they’re the perfect canvas for all kinds of stuff, aren’t they? Oh my goodness, this looks and sounds amazing! Potatoes are my favorite food, I HAVE to try this out! Thanks for the recipe!! I’m glad, Alia! I think you’ll love them if you love potatoes as much as me!